There are more than 30 airports within 50 miles of San Antonio, Texas, ranging from commercial hubs and general aviation airports to an array of private airfields, and ACA can help decide which airport best suits the goals of your flight. Many of the local airfield are dedicated to general and private aviation, and offer facilities more geared towards private flyers, including an array of private FBO terminals. Speak with one of our advisors to review all of the options for your flight to the Lone Star State. Fly private to San Antonio International Airport (IATA: SAT, ICAO: KSAT, FAA LID: SAT), an international airport located 8 miles north of Downtown. The airport is centrally located just 10 miles north of the city’s famous Riverwalk, welcoming more than 8 million passengers annually to the 3rd largest city in Texas and the 7th largest city in the United States. 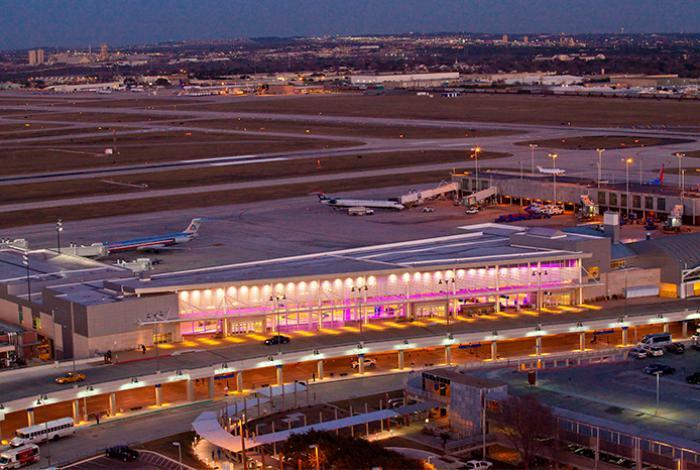 Facilities at San Antonio International (SAT) include 2 terminal buildings with 24 jet bridges, and 2 concrete runways measuring just over 8,500 feet each (4/22; 13R/31L) allow larger jets and VIP airliners to operate here; a third runway measures 5,519 feet (13L/31R) for additional traffic. Private jet travelers can use one of 4 FBOs located at the airport for fast and efficient departures. A major expansion project is underway to add new terminals, parking facilities, and increase SAT’s gate capacity to 35. There are simultaneous construction projects on I-410 and US 281 to improve access to the airport, and future plans include converting Stinson Municipal Airport (SFF), a popular general aviation field, into the city’s second commercial airport. 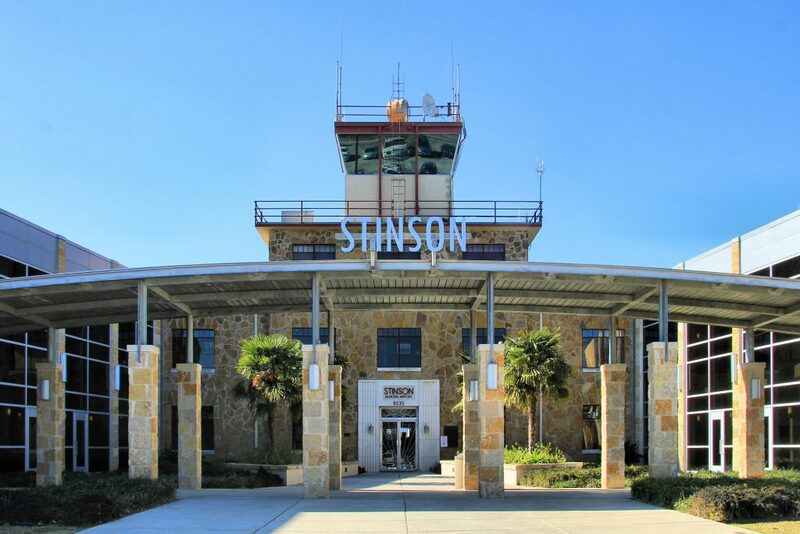 Light & midsize jets as well as turboprops can arrive/depart using Stinson Municipal Airport (IATA: SSF, ICAO: KSSF, FAA LID: SSF) , a general aviation airport located 7 miles south of downtown San Antonio in Bexar County, Texas. (SSF) Stinson Municipal is categorized as a reliever for KSAT, offering 3 asphalt runways, plus an additional grass runway for piston and prop-based general aviation activities. Stinson is a busy airfield, registering more than 150,000 aircraft movements annually, and it serves as the base to more than 40 aircraft. Facilities at Stinson Field include an FBO, two flight schools, police and state aviation units, two aerial photography companies, a helicopter tour company and helicopter flight school, and a variety of general aviation aircraft. Runway 9/27 was re-surfaced and extended to 5,002 feet to accommodate more private and business jet traffic. Business jets can arrange for their flight to go in/out of Kelly Field Annex (IATA: SKF, ICAO: KSKF, FAA LID: SKF), formerly part of the Kelly Air Force Base located in San Antonio, Texas. The airfield features an 11,550 foot runway to accommodate larger aircraft and cargo operations, and Atlantic Aviation operates an FBO on-site. Book a private flight to Castroville Municipal Airport (IATA: CVB, ICAO: KCVB, FAA LID: CVB), located on the east side of the city just over 20 minutes from downtown San Antonio. Castroville Municipal is classified as a general aviation airport, and its B-II classification supports a weight category of 15,000 pound, single wheel aircraft, for up to 12 passengers; runway 16/34 was extended to to 5,001 feet to allow corporate jets to operate at CVB. Have any questions regarding the private airport options in San Antonio? Call us at 1-888-987-5387 to speak with one of our brokers and discuss all of the available airports.